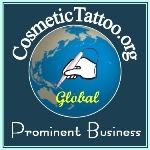 As most Medical Tattooist would know there are some clients/patients whom unfortunately we are unable to help adequately with Cosmetic Tattooing, here at the CTshop we have been actively searching around the globe for a camouflage product that is suitable for those clients. We rigorously tested a range of brands and product types and finally we found the answer that we and our clients had been looking for, developed in Italy by a leading Plastic Surgery, Cosmetic Medicine and Training Group. In November 2012 I travelled to Italy and trained one on one with the Technical Director of Ripar Cosmetics Rita Parente in the use of RiparCover Camouflage makeup and we are proud to have been selected as the exclusive distributor for Ripar throughout Australia & New Zealand. This incredible product range provides clients/patients with the ability to effectively conceal skin lesions for long periods of time (up to 24 hours or more) and if applied correctly it is even water resistant. Skin lesions can cause immense psychological distress for the sufferer, now finally we have high quality and effective product that offers our clients/patients the ability to live a normal life. In this category you will find the range RiparCover Camouflage Creams.